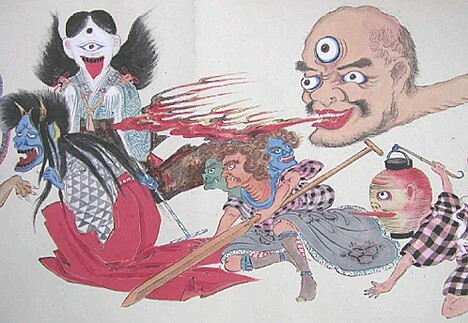 This October, Japan's National Science Museum (Ueno, Tokyo) will host an exhibit of monster-related cultural artifacts, including the mummies of a mermaid and tengu (long-nosed goblin), as well as a selection of items documenting other traditional Japanese monsters like the kappa. Scheduled to run from October 17 to November 12, the exhibit will feature about 100 historical items concerning legendary beasts and apparitions (yokai) from the Edo period to the present day. The exhibit is organized by the National Science Museum and the Ikimono Bunkashi Gakkai, whose members include Imperial Prince Akishinomiya. On September 19, experts armed with state-of-the-art equipment began taking X-rays of the mummified tengu and mermaid, which belong to the Hachinohe City Museum in Aomori prefecture. The specimens, both of which are about 30 centimeters long, are commonly believed to be artistic creations made sometime during the first half of the 19th century. The tengu is believed to be an elaborate sculpture whose materials include paper, the head of a monkey and the body of a bird. The mermaid, also regarded as a sculptural work, is believed to consist of a wooden upper body attached to the tail of an actual fish. The exhibit will feature the X-rays of both creatures. this is just to weird to me i am scared i wonder what they eat? ok, its me agian have you seen the dead mermaid page it is so werid i geuss i was right about mermaids. Thats so scary i wonder if any one has seen a mermaid alive before.!!!!!!! Wow, I'd love to see that exhibit. Any idea if it plans to tour at all?